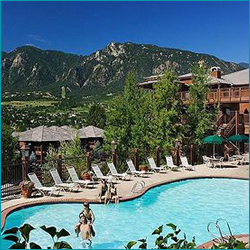 Find savings for Cheyenne Mountain Resort Lodging in Colorado Springs Colorado. Book early to receive the best available pricing on great lodging and hotel deals or simply visit this link directly for Cheyenne Mountain Resort Disounts. Cheyenne Mountain Resort is your Colorado Springs area destination. One of the top-rated lodging properties in the area, the resort offers great business class and spa amenities, access to golf at the Broadmoor Golf Club, a bar/lounge with poolside bar and more – with many other activities and visitor destinations nearby including: Pikes Peak and the Cog Railway, Garden of the Gods, Manitou Springs, the Air Force Academy, Cheyenne Mountain Zoo, and much more!